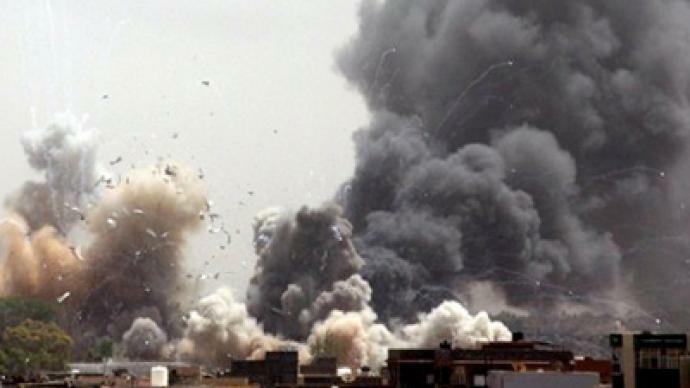 Fresh airstrikes hit Tripoli in the early hours of Wednesday as NATO continues its assault. At least ten more explosions were reported in the capital hours later. Russia’s envoy is in the region on a diplomatic mission to try to end the conflict. ­Alliance officials warned for days that they were increasing the scope and intensity of their air campaign to oust Libyan leader Muammar Gaddafi. British and French attack helicopters struck for the first time inside Libya over the weekend. As RT’s Maria Finoshina reports from Tripoli, it was the strongest attack since the start of the operation in March. Dozens of bombs have been striking the city every few hours, amounting to over 60 airstrikes across the capital since Tuesday. These are the first daytime raids, as, according to local residents, previous attacks happened mostly overnight. Government claims the latest bombs killed 31 people. Black smoke could be seen around the city. 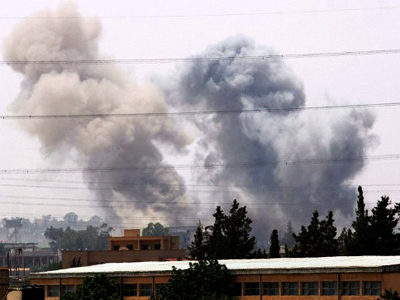 So far NATO forces have not acknowledged that their attacks caused any civilian casualties. Meanwhile, NATO Secretary General Anders Fogh Rasmussen said he was going to use a two-day meeting of alliance defense ministers starting on Wednesday at NATO's Brussels headquarters to push for broader participation from allies. The NATO ministers of defense officially confirmed the expansion of the UN mandate in Libya, which means the operation will continue at least through the end of September. They announced the alliance will pressure Gaddafi for as long as it takes for him to give up power. At the same time, the Chairman of the NATO Military Committee, Admiral Giampaolo Di Paola has once again ruled out any ground operation in Libya, reminding that NATO has more than once reiterated “there would be no NATO soldiers on Libyan soil”. However, NATO’s Secretary General is pushing for more countries to participate in the military operation, as so far only eight out of 28 NATO members have joined the air raids. Meanwhile, Sweden, which is not in NATO, is preparing to send its marines to enforce the alliance’s weapons embargo and has agreed to extend its participation in the operation. 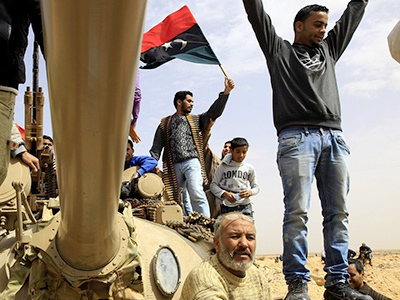 With the intensification of the attacks on Tripoli, the rebels in Benghazi are becoming frustrated with NATO’s actions, as they worry the alliance is taking control over what they see as a national uprising, RT’s Maria Finoshina reports from the Libyan capital. ­Russia’s presidential envoy, who is on a peace mission to the region, says the Libyan National Transitional Council and a part of the political elite in Tripoli are ready for dialogue. Russia's mediator has visited the rebel headquarters on a peace mission, to try and spur on dialogue with Tripoli to take Libya forward. “We have a feeling that the National Transitional Council is ready for dialogue,” Margelov said on air at Echo of Moscow radio station on Wednesday. “They said nobody is going to scalp him and decorate a cabinet. The members of the Transitional Council said any future for Gaddafi is acceptable for them but neither Gaddafi, nor any member of his family can be involved in any political activity or hold any high positions,” he added. Margelov also said the opposition stressed they are not going to seize power in Libya forever; they realize they are only a transitional body. The Russian mediator confirmed that the rebels offered Russia the opportunity to open its mission in Benghazi. After Benghazi, Margelov went straight to Cairo where he met with Gaddafi’s cousin Ahmed Qaddaf Eddam. Eddam once belonged to Gaddafi’s close circle and the Colonel heavily relied on him. Libyan opposition accused Ahmed Qaddaf Eddam of recruiting contractors for Gaddafi, but later in May Eddam called on his native tribe to join the rebels. For the moment, Eddam represents a part of the political elite in Tripoli. Following these meetings, Margelov said “both sides are well aware that the current political situation in Libya cannot be resolved by military means and the country's revival is now on the agenda”. 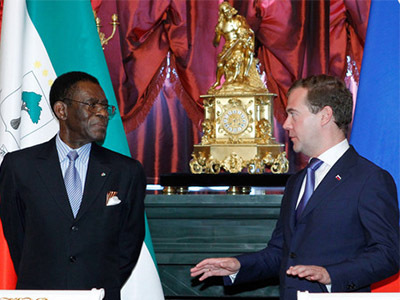 Margelov also said he is ready to meet Gaddafi if the Colonel is ready to see him. “The mediator recognizes everyone who is able to influence the political situation and security. I have met Muammar Gaddafi before and am ready to meet him now if he is ready to receive me now,” he said. Margelov added the crisis can be resolved by Libyans only, without any foreign intervention.